Cliff Thomas visits Buckfastleigh and finds traditional skills and historic engineering machines at South Devon Railway are as relevant to railways today as they ever were. AT THE northern end of the South Devon Railway’s Buckfastleigh site, away from the public areas of the line’s many attractions, there are some outwardly innocuous looking buildings… but behind the roller shutter doors are engineering treasures and a thriving loco repair business. An overview along the length of the main workshops. 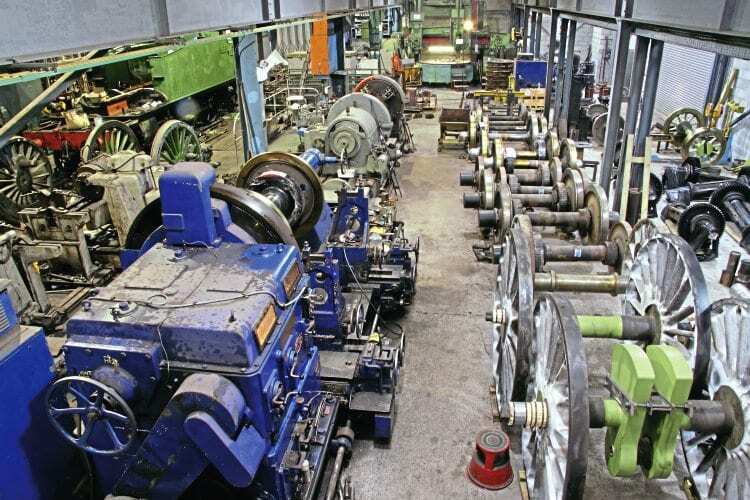 The blue machine nearest the camera is the Craven lathe for turning wheel journals, beyond which is a wheel lathe (note the slightly elevated control position for the operator surrounded by guard rails). To the left is part of the wheel-quartering machine with SDR’s ‘4575’ No. 5526 upper left. At the far end is the vertical boring machine. An overhead travelling crane runs the length of the works above the girders at the top of the picture. The preservation aims of a railway such as the old branch from Totnes are to conserve and if necessary re-create something of past times, with compromises to meet modern standards and expectations. Like it or not, heritage railways must compete in the tourist market. The steam locomotives and vintage carriages central to the heritage railway experience must be restored, maintained and overhauled to the highest standards – how better to do this than save and use the kind of machines which produced them in the first instance, utilising the same traditional craft skills, while in turn creating a business which provides a service to other heritage and modern railways and boosts income to its host line. This is the story behind South Devon Railway Engineering, a subsidiary company set up by South Devon Railway Trust, the registered charity which owns and operates the South Devon Railway between Buckfastleigh and Totnes Littlehempston. A business which has grown to become a leading specialist in the manufacture, repair and refurbishment of steam boilers and rail vehicle wheels (from steam to main line train operating companies) together with a range of other railway engineering services, providing employment for people ranging in age from early 20s to early 80s.